Beyerdynamic DTX 101 iE review | What Hi-Fi? There are lots of great earphones around, but these ones are perhaps the best performance-per-pound proposition of the lot. 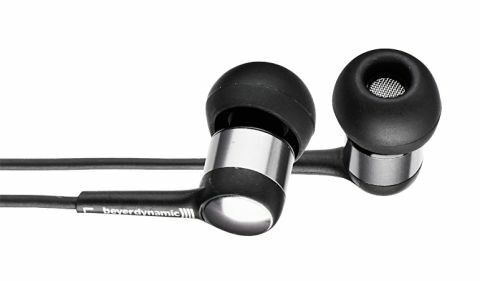 For £64 you get from Beyerdynamics a smart but otherwise fairly unspectacular-looking pair of in-ears – you can choose a red finish if you want your headphones to be a little more eye-catching. More importantly, your money buys you a beautifully balanced performance with sparkly, controlled treble and the kind of bass that not only underpins and solidifies the presentation, but also adds lovely fullness to vocals. The dynamic shifts of Nick Cave’s The Road OST are handled with ease, but there’s punchy, giddy excitement to be had, too, as a quick spin of Friendly Fires’ Pala album quickly proves. Essentially, they’ll happily turn their hands to anything you might throw at them. The three supplied pairs of tips makes it easy to find a comfortable, noise-isolating fit. Our only niggle is the cable noise, but this can be easily cured by running the wires over your ears before popping the buds in – they’re more secure that way, anyway.